BAD!SLAM!NO!BISCUIT! wakes from torpor to bring you the GODZILLA edition. You may not know why, Why, WHY! 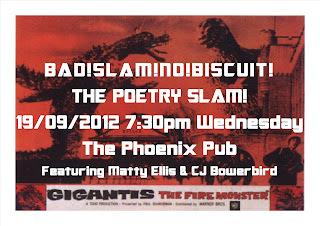 So bring your poems, your rants, your really short stories, your WHY did they have a baby Godzilla cartoon to BAD!SLAM!NO!BISCUIT! Because we want your words on stage for two minutes with two microphones, an audience in front, The Score Adder, the Sound Guy, two MCs, THE MASTER OF CONFLICT, maybe a Mister of Conflict, numerous 1st prizes, all within easy reach of a bar full of alcohol, and several toilets. Yes toilets; RAR! FLAMES! LAZER EYES! 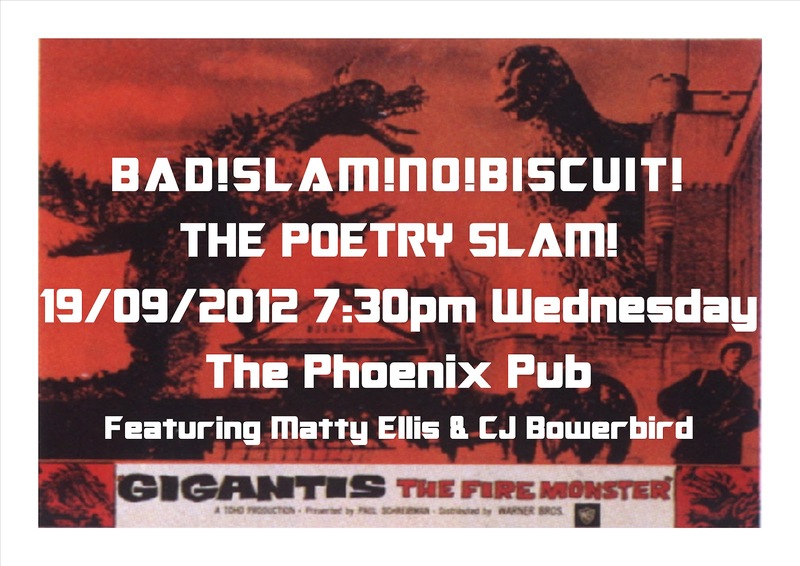 We also bring you two feature acts for the re-birth of the GODZILLA BAD!SLAM!NO!BISCUIT! Straight from the Ellis Collective to the stage for you Matty Ellis takes an unconventional approach to storytelling that recounts the jagged-edged disappointments of everyday life, his songs are undeniably unique and unmistakably Australian. CJ Bowerbird is a performance poet. He writes and performs poems about things he has lost, things he never had and things that are slipping through his fingers. He too is unmistakably Australian. So join BAD!SLAM!NO!BISCUIT! at the Phoenix for poetry, music, drinking, FIRST PRIZES, and remember no props, no musical accompaniment, and your words at the Phoneix, 730pm sign-up for the 8pm start.